Josh Peckler - Jpeckler@shawmedia.com Prairie Ridge's Joe Cowlin runs during the Fox Valley Conference cross country meet at Emricson Park in Woodstock Saturday, October 13, 2012. 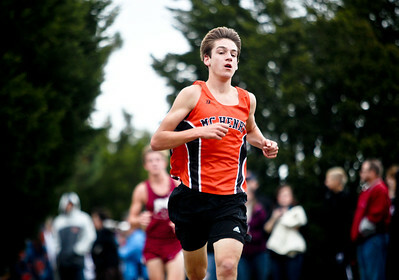 Josh Peckler - Jpeckler@shawmedia.com Mchenry's Jesse Reiser runs during the Fox Valley Conference cross country meet at Emricson Park in Woodstock Saturday, October 13, 2012. Sarah Nader - snader@shawmedia.com Brice Alt (right) competes in the fourth annual Run and Roll for the Dole in Crystal Lake on Sunday, October 14, 2012. 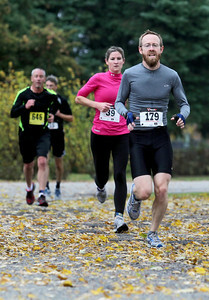 The race featured a 2 mile run through Crystal Lake, 20k bike course and a repeat of the 2 mile to the finish line. All proceeds from the race will benefit Lakeside Legacy Foundation and Historic Dole Mansion. Sarah Nader - snader@shawmedia.com Jon Kabance of Chicago straps on his helmet while competing in the fourth annual Run and Roll for the Dole in Crystal Lake on Sunday, October 14, 2012. 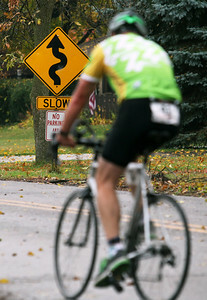 The race featured a 2 mile run through Crystal Lake, 20k bike course and a repeat of the 2 mile to the finish line. All proceeds from the race will benefit Lakeside Legacy Foundation and Historic Dole Mansion. 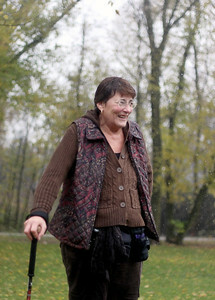 Sarah Nader - snader@shawmedia.com Sue Kreibich of Algonquin gets drenched in rain while participating in the Cardunal Crop Hunger Walk in Algonquin on Sunday, October 14, 2012. The 2.2 or 3 mile walk was held to help children and families worldwide and in the U.S. to have food for today, while building for a better tomorrow. Sarah Nader - snader@shawmedia.com Racers participate in the fourth annual Run and Roll for the Dole in Crystal Lake on Sunday, October 14, 2012. 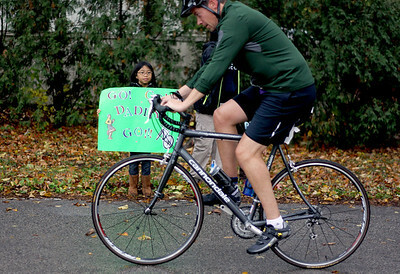 The race featured a 2 mile run through Crystal Lake, 20k bike course and a repeat of the 2 mile to the finish line. All proceeds from the race will benefit Lakeside Legacy Foundation and Historic Dole Mansion. Sarah Nader - snader@shawmedia.com Ken Bolin competes in the fourth annual Run and Roll for the Dole in Crystal Lake on Sunday, October 14, 2012. The race featured a 2 mile run through Crystal Lake, 20k bike course and a repeat of the 2 mile to the finish line. All proceeds from the race will benefit Lakeside Legacy Foundation and Historic Dole Mansion. Sarah Nader - snader@shawmedia.com Racers compete in the fourth annual Run and Roll for the Dole in Crystal Lake on Sunday, October 14, 2012. 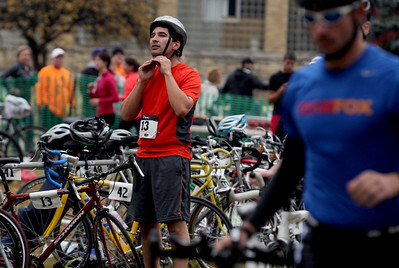 The race featured a 2 mile run through Crystal Lake, 20k bike course and a repeat of the 2 mile to the finish line. All proceeds from the race will benefit Lakeside Legacy Foundation and Historic Dole Mansion. Sarah Nader - snader@shawmedia.com Bianca Jimenez, 7, of Bollingbrook cheers on her dad while he competes in the fourth annual Run and Roll for the Dole in Crystal Lake on Sunday, October 14, 2012. 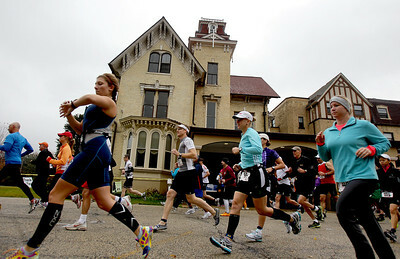 The race featured a 2 mile run through Crystal Lake, 20k bike course and a repeat of the 2 mile to the finish line. All proceeds from the race will benefit Lakeside Legacy Foundation and Historic Dole Mansion. Josh Peckler - Jpeckler@shawmedia.com Anne Tolosa of Kenosha, Wisc. 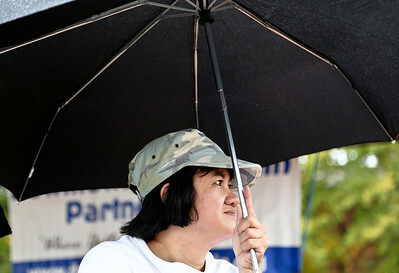 sits under a umbrella as it rains during the The Old Time Country Harvest Festival in Algonquin Saturday, October 13, 2012. Due to rain very few people came out to enjoy the events Saturday. 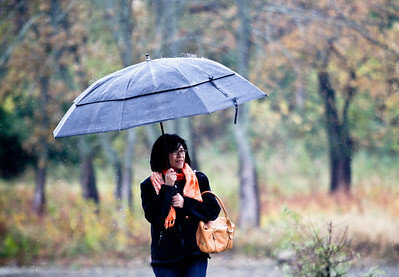 Josh Peckler - Jpeckler@shawmedia.com Adona Posecion of Algonquin uses a umbrella while walking through the rain during the The Old Time Country Harvest Festival in Algonquin Saturday, October 13, 2012. Due to rain very few people came out to enjoy the events Saturday. Mike Greene - mgreene@shawmedia.com Kaiti Hart, a teacher in District 46 for 12 years, holds a sign while on strike Friday, October 12, 2012 outside of the Prairie Grove District 46 campus in Prairie Grove. 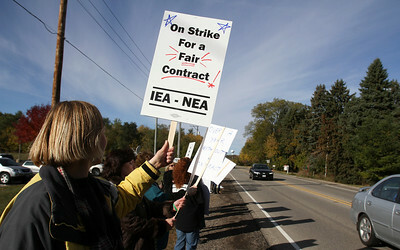 Teachers in the district went on strike Friday morning and are currently in contract negotiations. Mike Greene - mgreene@shawmedia.com Kaiti Hart, a teacher in District 46 for 12 years, leads a group of teachers in chants while on strike Friday, October 12, 2012 outside of the Prairie Grove District 46 campus in Prairie Grove. 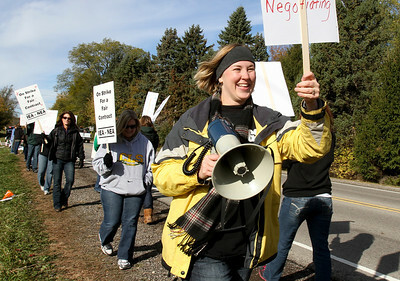 Teachers in the district went on strike Friday morning and are currently in contract negotiations. 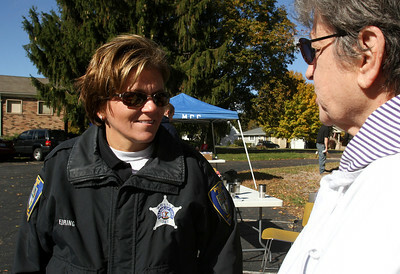 Mike Greene - mgreene@shawmedia.com Cary Police Officer Kathy Eiring speaks with Jean Anderson, of Cary, during a vehicle safety inspection event Friday, October 12, 2012 at Korean Methodist Church in Cary. Eiring, an Elderly Service Officer, speaks regularly with seniors about potential concerns and suggested Anderson come to the event when speaking at the Cary Senior Center. 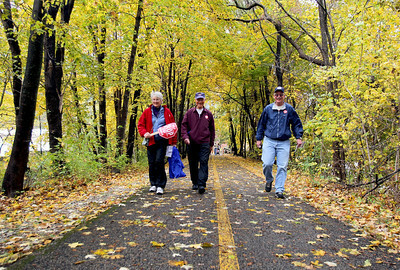 Sarah Nader - snader@shawmedia.com Katy Spooner (left) of Huntley, Ken Spooner of Huntley and Dave Clark of Lake in the Hills participate in the Cardunal Crop Hunger Walk in Algonquin on Sunday, October 14, 2012. The 2.2 or 3 mile walk was held to help children and families worldwide and in the U.S. to have food for today, while building for a better tomorrow. 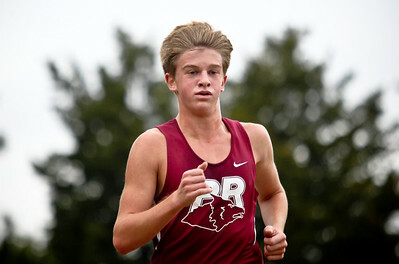 Prairie Ridge's Joe Cowlin runs during the Fox Valley Conference cross country meet at Emricson Park in Woodstock Saturday, October 13, 2012.